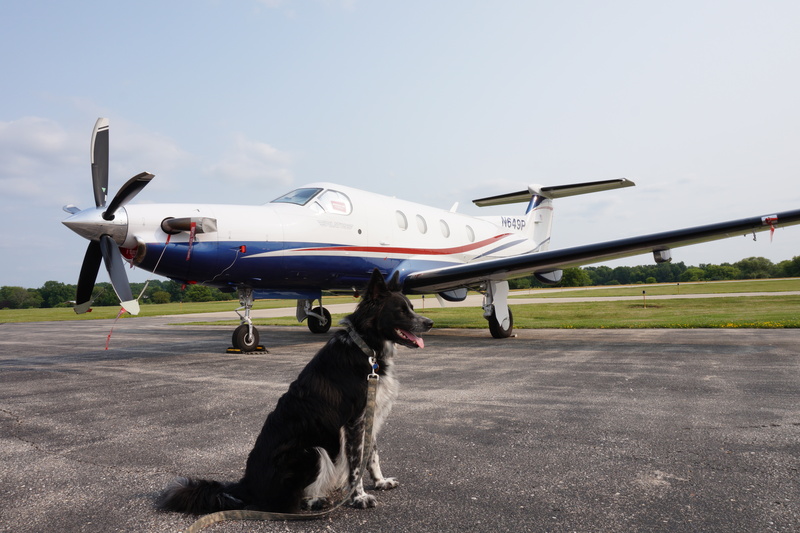 Blah…blah…blah…the important part of the story is that My Dad and I drove up to the Burlington, WI Municipal Airport (KBUU) in the Scion xB to retrieve a young female Border Collie who was being flown in from Campbellsville, Kentucky. Her flight was on-again, off-again, on-again, due to weather and pilot availability issues, and we finally got the green light to GO at 2:00 p.m. When I jumped into the back of the xB, I got worried…the CRATE had been installed in the back. My Dad didn’t say anything about me having to go in the crate. He did make a comment about an adventure that featured hamburgers. Hey, I’m IN! The drive was about 80 minutes up to Burlington (population about 10,000) and My Dad always seems to know where he is going. 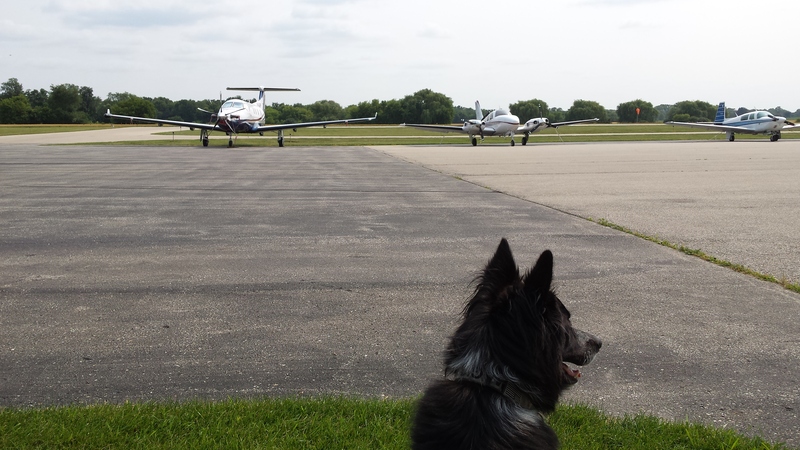 The airport was cool, and no one seemed to mind a well-behaved Border collie walking the flightline. 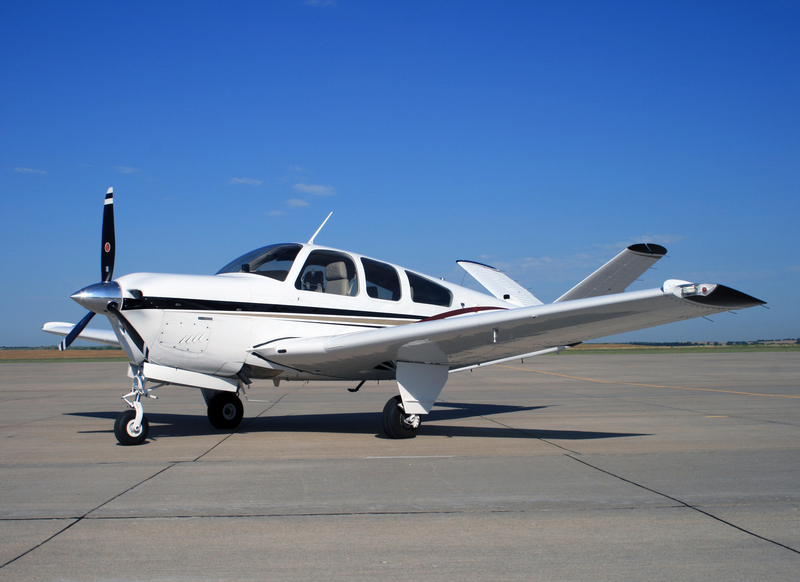 In the background is a Pilatus PC-12, built in Switzerland. My Dad talks to everyone, and always introduces me. This WACO biplane pilot is based in Waukegan and flies 767s for American Airlines…a former military aviator. My Dad left me tethered at the xB and he met the V-Tail at the terminal. 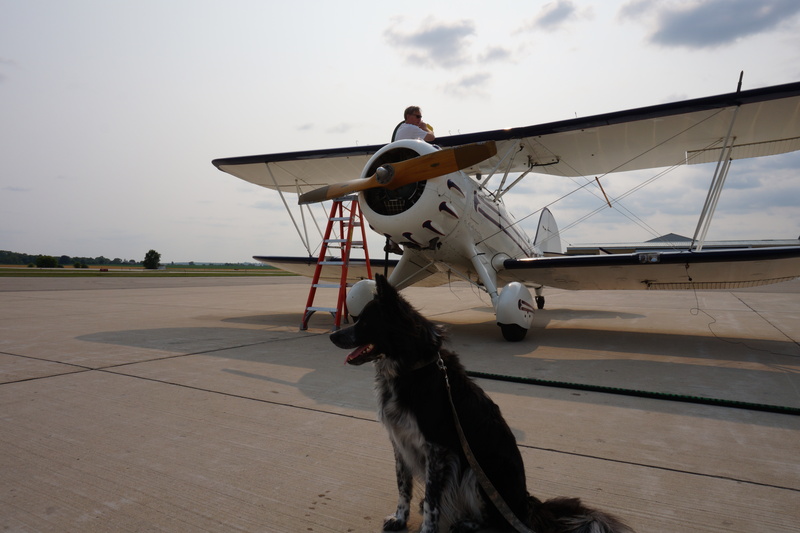 NILLA was unloaded by the two pilots and the first thing she did was to put her front paws on My Dad and gave him a hug and a kiss on the ear – something I like to do. I gave NILLA a quick briefing, we touched noses, and My Dad took her for a walk. She was very thirsty. NILLA was very quiet in her crate on the drive home. My Dad gave her a bath with warm wet towels and he asked me to give her a warmer welcome…no problem, I like everyone! NILLA is learning to go the bathroom OUTSIDE, and she is a quick learner. She had a few accidents but My Dad has been very patient with her. She can really eat! 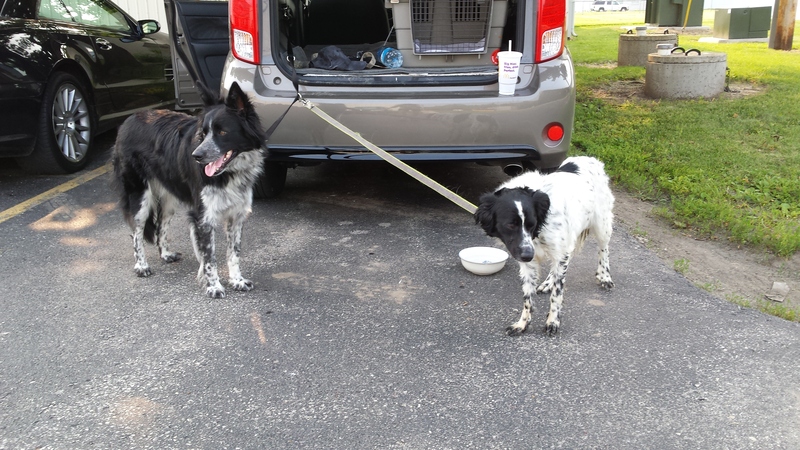 This entry was tagged border collie, border collie rescue, border collies, dog behavior, dog rescue, dogs and people, herding dogs, life with dogs. Bookmark the permalink. Hi Chris, NILLA is merely a transient until her real foster mom can take possession of her…tomorrow. Oh wow. Your dad sure knows his airplanes and all that aircraft info is very interesting. The lady BC is a beauty and I’m wanting to know if you guys picked her up for BC rescue or will she be a keeper and get to live in your house and be your new pal? That would be so great to have a buddy but either way – your dad did a really good deed. He deserves a star in his cap or hat. NILLA was picked up at the Burlington, WI airport for Great Lakes Border Collie Rescue, where my resident BC, MAGIC, was adopted from in December 2014. NILLA’s foster was not able to take possession of her until tomorrow. She sure is a pretty dog and someone will be lucky when they adopt her. Is Nilla coming to stay? NILLA is a transient. Tomorrow, I will take her to her full-time foster Mom up in the Milwaukee area. 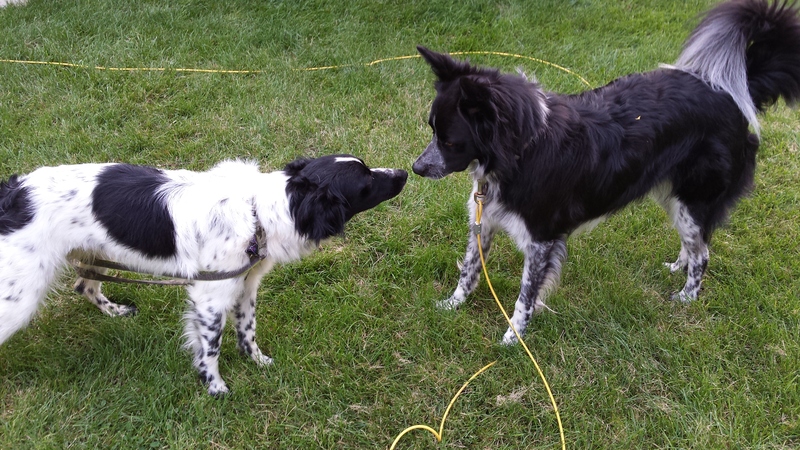 You will be able to check her out on the Great Lakes Border Collie Rescue website (where Magic came from).